Local journalist and historian Colin Grainger recalls the miracle of Grenadier Street, a Forgotten Stories gem amidst the horrors of war. Black Saturday and The Blitz bring many memories to different generations in the Royal Docks area. Even today, unexploded bombs are still being recovered as new communities are being created. Today the spotlight falls on the uninvited guest dropped by the Lufwaffe on North Woolwich 76 years ago. Thanks to the marvellous memory of one of the area’s oldest inhabitants, 91-year-old Joan Plant, we can record the remarkable tale. Locals had got used to the daily ritual of bombs attacking their neighbourhoods since the Blitz began in September, 1940. Within just a few months, hundreds of local people had lost their lives. Thousands of children had been evacuated to various parts of Britain from East London. These included Joan and sister Sheila, who had been sent away to Bath. Like many, they were missing their home terribly and kept in touch by letter. “We’d been told not to tell everyone where we came from (East London) and instead say we lived a short distance from Greenwich!” said Joan. Her parents Fred and Flo were still living in their home in Grenadier Street, North Woolwich. Next door, Grandad Grey, as he was known, lived with his daughter and three children Joan, Shirley and Robin. Bombs and rockets and planes flying over were something families had become familiar with. Then suddenly there was a new threat, parachute bombs or mines. These were naval mines dropped from an aircraft by parachute. They were mostly used in war by the Luftwaffe and frequently dropped on land targets. When detonated at roof level, rather than on impact, the aerodynamic effects of their blast were maximised. Instead of the shock waves from the explosion being cushioned by surrounding buildings, they could reach a wider area, with the potential to destroy a whole street of houses in a 110-yard radius and windows being blown in up to a mile away. It was in March 1941 that the latest parachute bombs were dropped on homes near the Royal Docks. An air raid siren had alerted the Plant and the Grey families to go quickly to the air raid shelter in Albert Road, around two streets from their house. But the two men in each house would not be budged. “My dad and Grandad Grey said Hitler was not going to get them out of their beds,” said Joan, who was 15 at the time. “All of a sudden a parachute mine sent to cause devastation hit the roof of number 13 next door to us. Everyone waited, expecting the worst, but it never happened. The whole street could have gone up, but an eerie silence was all that happened,” she said. “Mum and dad and Grandad Grey told me how the bomb landed making a kind of slithering noise,” said Joan. The ARP Wardens were on the scene of the drama within minutes and immediately starting evacuating people who had not left their homes when warned to by the earlier sirens. “Their bravery was incredible,” said Joan. The street was cordoned off for three days while bomb disposal experts dealt with more pressing emergencies. Eventually the Army Bomb Disposal Team came and made the bomb device safe and people were allowed to return to their homes. “Mum told me that the senior officer sent the lower ranks away to safety while he defused the bomb,” said Joan. 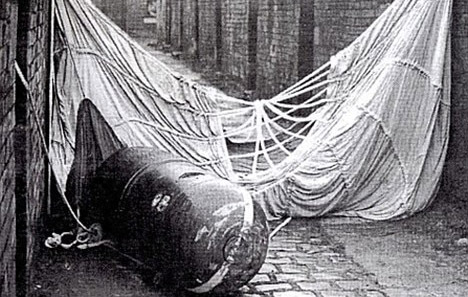 Eventually the bomb was made safe, but the remains of the mine bomb and the green silk parachute stayed – and the story of the amazing escape for families in Grenadier Street was about to take another twist. “One morning someone asked to come inside and have a look at the bomb and the silk,” said Joan. “The silk was beautiful and everyone wanted a piece, but we were told we could not have it. “So, as more people came to see what had become a tourist attraction, Grandad Grey put a chair outside the front door and a collecting bowl to help The War Effort. After a few more days the bomb and the parachute were eventually removed. 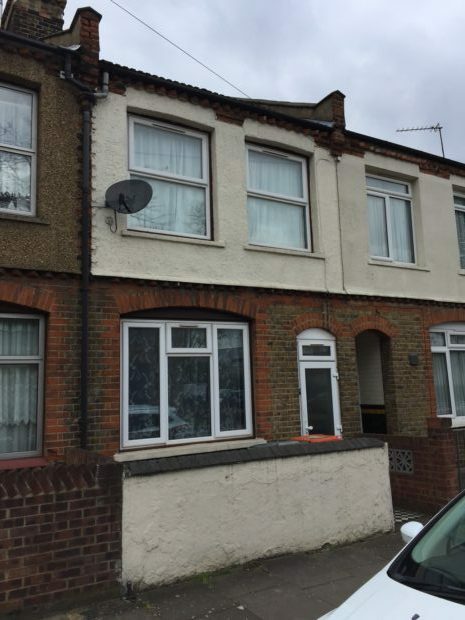 The money – which equates to nearly £900 today – was then taken to the local council. North Woolwich was part of Woolwich Borough Council at that time. It later became part of West Ham, and then Newham. “Each borough in London was asked its bit by raising money for The War Effort to help provide parts for planes to lead the fightback against Hitler,” said Joan. The money went towards constructing the North Woolwich Spitfire. And so it was that the unwelcome guest ended up helping to fund the campaign against the Nazis. The house in Grenadier Street, 2017. During the war, the Luftwaffe used a number of different kinds of parachute mine. The Luftmine A (LMA) and Luftmine B (LMB) weighed 1,100 lb and 2,200 lb. The LMA was 5 ft 8 in length and the LMB 8 ft 8 in. After the parachute opened, the mine would descend at around 40 miles per hour. If it came down on land, a clockwork mechanism would detonate the mine 25 seconds after impact. If the mine landed in water it would sink to the bottom. If the depth was greater than 8ft, water pressure and the dissolving of a water–soluble plug would deactivate the clockwork time-detonator, and activate an anti-shipping detonator. It was incredible that the one aimed at the docks and North Woolwich homes never ignited and caused widespread havoc. “Sadly here were no pictures of the parachute bomb drama. Everything had to be kept secret during the war. And we couldn’t afford a camera anyway!” added Joan. After searching through the documents of of Newham Archives in Stratford I managed to track down the exact day March 20,and time, 1.55am that the parachute mine fell on Grenadier Street. The listing is in the register of all bombings made in the old West Ham Bomb book for the entire war. The front page of the Stratford Express made reference to the fact that the overnight bombing of March 19 and 20 has been the worst so far in the history of the war to that point. But no mention was made of the miracle in the area’s ‘island community’ of North Woolwich in that edition or in subsequent editions and it became a Forgotten Story. The falling bombs became a way of life. But this one was special. “Even now, we feel cheated we did not get to keep the silk parachute!” said Joan. “One of the severe bombings, one evening, saw many ships hit and burning fuel escaped into the water and set it alight. Many buildings were also hit by the bombs, houses and factories. Thousands lost their lives and for many years after the war, UXBs (Unexploded Bombs) were found, disrupting local life. Even 50 years on from the war in the 1970s another unexpected guest was unearthed in Plaistow. It is said to be one of biggest and hundreds of people had to be moved out while the Army blew it up. More continue to be found to this day. I played on many bombsites in North Woolwich and Silvertown from the late 1950s to the late 60s and I have covered many stories about unexploded bombs in my years as a journalist. They serve as a stark reminder of what our parents and grandparents went through. They also remind us of the heroism shown not only by servicemen and women in combat, but also at home by the emergency services and the volunteer wardens. But it is the tale of the uninvited guest who came to stay in North Woolwich that throws the focus on how lives were changed forever. Pictures: Newham Archives and Local Studies Library and Colin Grainger collection.